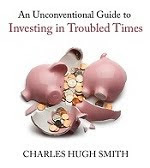 oftwominds-Charles Hugh Smith: China's "Nuclear Financial Option" Downgraded to "Financial Firecracker"
China's "Nuclear Financial Option" Downgraded to "Financial Firecracker"
China's "nuclear option"--selling its vast stash of U.S. Treasuries to wreak havoc on the U.S. economy and interest rates--has been downgraded by the flood of U.S. investors who have exited stocks in favor of Treasury bonds. 1. The U.S. government has run a massive deficit since 2001. 2. Enamoured of real estate and stocks, U.S. investors shunned low-yield U.S. Treasury bonds (T-Bills). 3. As China's trade surpluses with the U.S. surged, generating billions in dollars that China needed to park in a safe, liquid market. U.S. Treasuries offered just such a market. 4. Following the lead of its mercantilist exporter neighbor Japan, which had long recycled its trade surpluses into Treasuries, China soaked up U.S. Treasuries for another reason: to keep interest rates low in one of its biggest markets (the U.S.). 5. If demand for Treasuries slumped, interest rates would rise, rippling through the U.S. economy, pinching credit-dependent U.S. consumers who would then buy fewer goods imported from China. 6. China buying massive quantities of U.S. Treasuries was thus a "ewin-win" situation for both the credit-dependent U.S. and trade-surplus China. 7. This dynamic led to China's hoard of Treasuries swelling to a staggering $1.2 trillion. 8. As the U.S. dollar declined in value against gold and other currencies, China's leadership understandably became nervous about being so exposed to significant declines in the purchasing power of their $1.2 trillion stash of Treasuries. 9. In response, China has trimmed its purchases and moved its portfolio into shorter-term U.S. bonds which are less exposed to the risk of future inflation. 10. The sheer size of the Chinese portfolio launched the "nuclear option" speculation:could China sink the U.S. economy via the financial "weapon" of selling its vast holdings of Treasuries? 11. Were China (or any owner) to dump $500+ billion of Treasuries on the market in one fell swoop, the supply would exceed demand, and the likely result would be a sudden, steep rise in yields (interest rates) as the Treasury would have to raise rates to attract more capital. 12. This sudden leap up in interest rates would devastate the U.S. economy on multiple levels: real estate would tank as mortgage rates jumped, stock would become less attractive when compared to high-yielding bonds, and the holders of existing low-yield bonds would suffer massive losses in the market value of their bonds. U.S. consumers would also face higher costs of borrowing. 13. The linchpin of the "nuclear option" is the belief that China has "decoupled" from the U.S. economy and thus can risk the collapse of its exports to the U.S. as American consumers are too crimped by higher rates to buy more Chinese goods. As I showed yesterday, faith in "decoupling" is misplaced and unsupported by financial facts. 14. The other part of the "nuclear option" story is that China could express its displeasure over various political and trade issues merely by threatening to pursue the "nuclear option." But a funny thing happened to the "nuclear option" story": American investors have absorbed almost $4 trillion in U.S. Treasuries, making domestic owners the largest holders of Treasuries. China's holdings, as vast as they are, are now a modest percentage of domestic owners--as little as 25%. This domestic move out of equities and into Treasuries is a seachange with broad consequences. Hundreds of billions of dollars has been pulled out of U.S. equities and dumped into low-yield Treasuries. For context, recall that domestic U.S. assets (real estate, bonds, equities, and other marketable capital) is around $52 trillion. So owning $4 trillion in Treasuries--more than all non-U.S. owners combined, including China, Japan and the Gulf Oil states--does not require that great a percentage of U.S. capital. Even if U.S. owners absorbed another $4 trillion, that would make Treasuries less than 20% of total capital. There are limits to U.S. debt growth, however, and it is those limits which constitute "the nuclear option." The U.S. could readily absorb the entire Chinese portfolio ($1.2 trillion), but what it cannot absorb is $1.4 trillion in annual deficits, year after year. In other words, if dent is a "nuclear" weapon, the U.S. will have to set the weapon off itself by borrowing more than it can support out of national income. If the U.S. economy melts down due to over-borrowing, we have nobody to blame but ourselves. Ironically, perhaps, the key driver behind domestic purchases of Treasuries is the widespread disdain for stocks after two equity meltdowns in less than a single decade. The net result of this structural change is the Chinese "nuclear option" has been reduced to a firecracker. China's leverage has slipped along with its percentage of the total Treasury market, and with Americans' disavowal of equities as a rigged, risky market. Which side of the trade would you rather hold: China's dwindling share of U.S. bonds, or the U.S. share of Chinese exports? Let's put it this way: if China's export market implodes and its trade surplus disappears, the central government will have trouble creating the jobs needed to maintain its power. If China launches its "nucelar option," the market might be roiled for a short period of time, but their share of the total Treasury markets is simply too small now to be "nuclear." Perhaps the real "nuclear option" here is the potential for the U.S. to restrict China's imports to the U.S. market. Should China's exports dry up, it will face domestic turmoil on a scale few can imagine. This topic was suggested by a U.S. Navy officer currently deployed to a carrier group. Thank you, J., for an excellent suggestion. Thank you, Kevin K. (new bike seat), for your remarkably generous contribution to this site-- I am greatly honored by your support and readership.